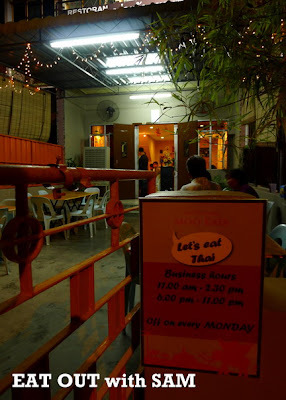 Aroy Chang MOO KATA was the first thai restaurant to introduce the Moo Kata - Thai Charcoal Grill and Steamboats to Penangites and the tourists in Penang. 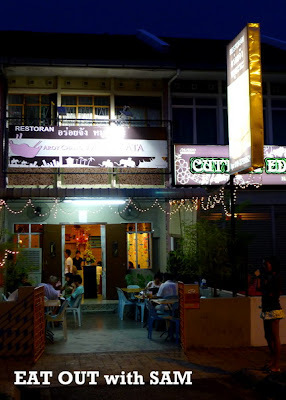 It was formerly operating at the ground floor of Desa Mawar Apartment. If you know the location of Wat Chayamangkalaram (Sleeping Buddha) and Dhammikarama Burmese Buddhist Temple, you will hardly miss Aroy Chang MOO KATA. No. 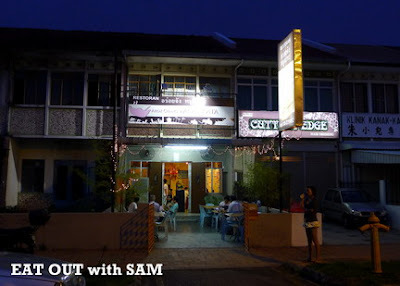 22, Burmah Lane, George Town, Penang. ﻿As you travel along Kelawei Road from George Town, Burmah Lane is located on the right hand side. For your information, Burmah Lane is a one way traffic lane and you can only turn into it from Kelawei Road. When you turn into Burmah Lane, you will notice Wat Chayamangkalaram is on your right hand side and Dhammikarama Burmese Buddhist Temple is on your left hand side. They are facing each other and also not far away from the junction of Kelawei Road and Burmah Lane. Aroy Chang MOO RATA is located a few doors away immediately after the Dhammikarama Burmese Buddhist Temple. 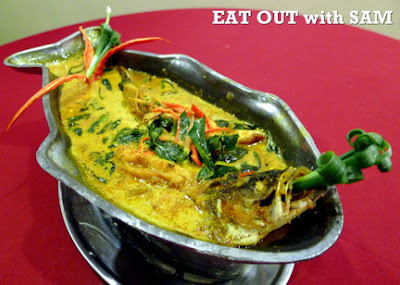 Aroy Chang MOO RATA prepares and serves mostly authentic Thai Dishes from Northern Thailand (i.e. Chiang Mai and Chiang Rai). 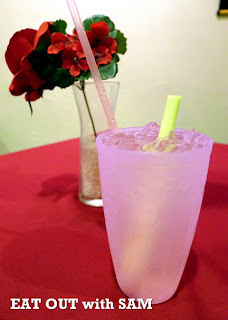 I love this Ice Lemongrass Juice and it was so pleasant and refreshing with a mild taste of sweetness together the fragrance of lemongrass. It can be served as a welcome drink. I was given to understand that the stalks of lemongrass, slices of ginger and pandan leaves were placed in a pot with water and brought to boil. Slight sugar was added to taste. 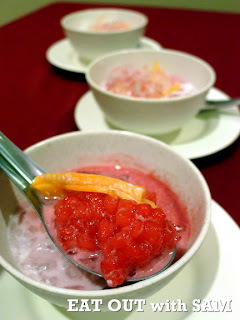 Too much sugar will drown the aroma of lemongrass, ginger and pandan leaves. Nowadays a lot of people claimed that the lemongrass therapeutic drink will bring health benefits such as detoxify the body, improve blood circulation, anti-cancer, high antioxidant, reduce blood pressure and cholesterol, ease arthritic pain and etc. Som Tam is a very popular Thai Salad. 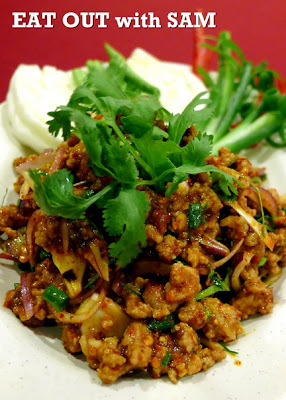 There are many variations of preparing and usage of ingredients for Som Tam. Chillies and galic are first pounded with a mortar and pestle (krok). 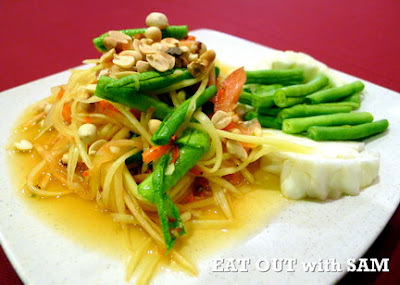 Grated green papaya are tossed together with tamarind juice, fish sauce, tomatoes, lime juice, sugar cane paste, string beans, cabbages, dried shrimp and toasted peanuts in the krok. Great dish as a starter with sweet, salty, and spicy flavors paired with the crisp crunch of the green papaya together with the ingredients to give you the appetite before your meal. 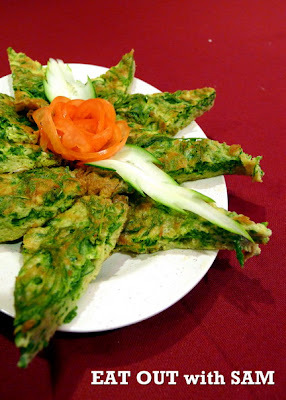 It is a kind of Thai Style Omelette with the usage of Cha Om. The green feathery shoots belong to a species of Acacia which is known as Acacia Pennata (Climbing Wattle) which are commonly used in omelettes, stir-fries, curries and soups in Laos, Burma and Thailand. It can be eaten raw too. Only the soft tops of the stalks are edible. Cha Om Omelette is also popular among the Burmese too. Some people claimed that it has a sulfurous smell but to my surprise when i tasted the Cha Om Omelette, it did not yeild that smell and was tasted like heaven to me. Perhaps when it cooked, the sulfurous smell has been eliminated. It is best eaten with . 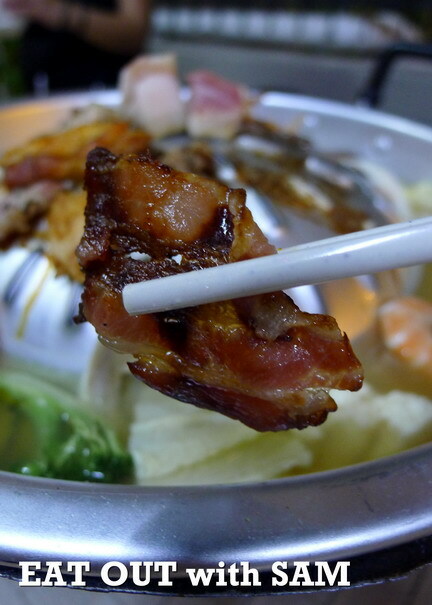 It is best eaten with a squirt of chili sauce (sauce prik). Trust me ... If you love vegetable, I am sure that you will love this dish. The thin coated batter prawns were deep fried and were laced with the tarmarind sause with the combination of other ingredients. 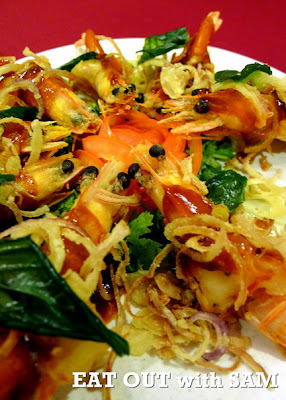 Deep fried onions and thai basil (bai horapa) were sprinkled on top of the dish as garnishes. 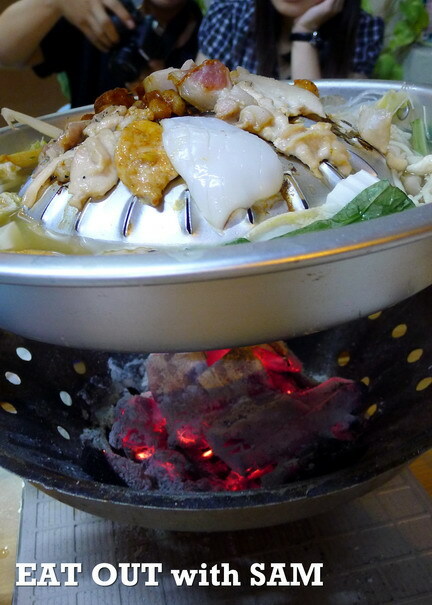 Do not miss this dish when you dine in Aroy Chang MOO KATA. 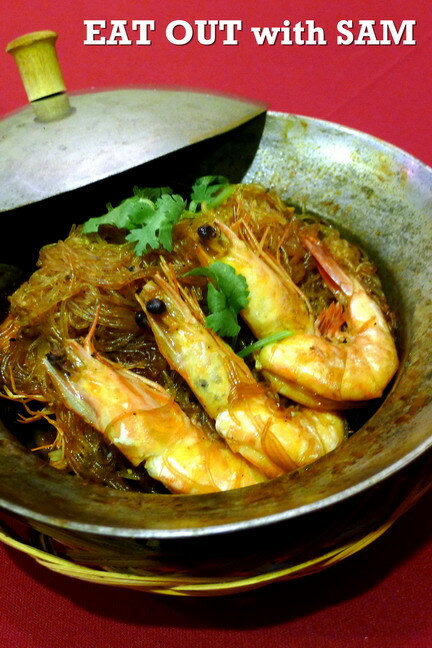 This dish was filled with 3 sauteed prawns and celliphone noodles (glass noodles) in a special blended savory sauce which was mainly made up of minced garlic, soy sauce, fish sauce and dark soy sauce. All the sauce has been absorbed by the glass noodles. They were served semi dry and slightly sticky. Fresh cilantro was sprinkled on top. It is very suitable for all ages because it is non-spicy and a Must-Try Dish. 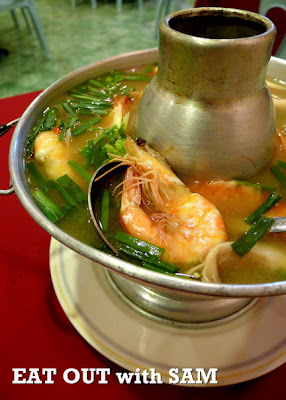 This Clear Seafood Tomyam is teeming with prawns, squids, fish, abalone mushrooms, tomatoes, lemongrass, galangalm spring onions and kaffir lime leaves. Normally I find that the taste of the soup is very explosive (hot & spicey) when it touches the tip of your tongue but this one was a bit mild and lack of chilli padi (bird's eye chilies). 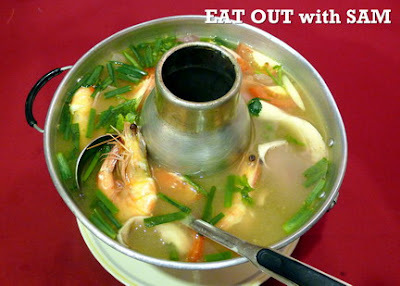 Choice of Soups - Chicken Stock, Tom Yam Stock and Clear Tom Yam Stock. 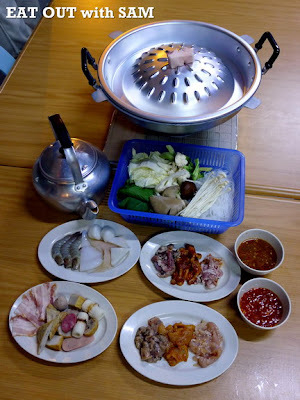 ﻿So far until todate you can find that Aroy Chang MOO KATA is the only 1st serving this Thai Traditional Charcoal Grill & Steamboat (Signature Dish) on Penang Island. 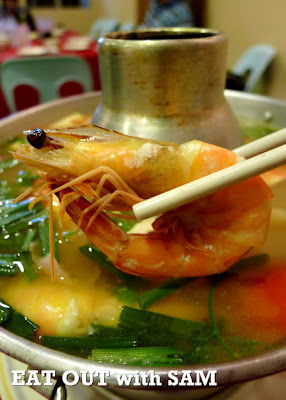 The ingredients were made up with the combinations of raw seafood (i.e. 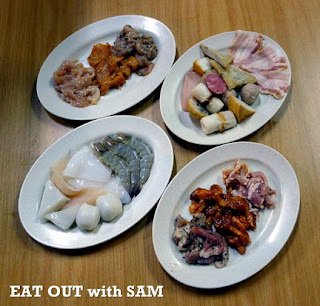 prawns, squids & fish), fish balls, fish cakes, pork balls, pork bacons, quail eggs and 3 types of marinated meat (i.e. 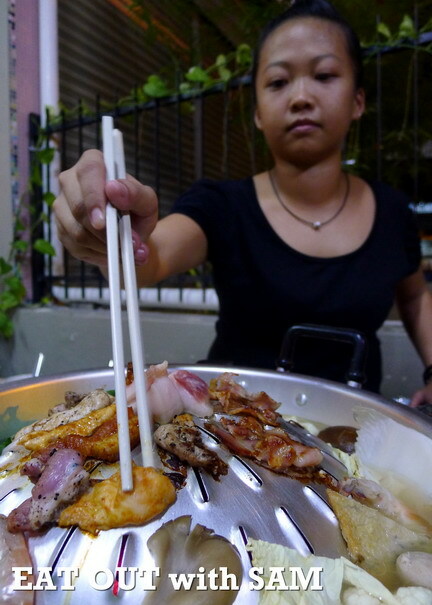 chicken & pork). Not forgetting a basket filled with glass noodles, abalone mushrooms, golden needle mushroom, cabbage and etc. This will be fun and thrilling to grill your own meats and cook your food.